Next to Charlie Chaplin’s His New Job, the most important surviving film made by Chicago’s Essanay Studios, and arguably the masterpiece of all of their extant movies, is From the Submerged, a drama released in November of 1912 that was written and directed by Theodore Wharton and starring the beautiful Ruth Stonehouse. Theodore Wharton, a fascinating figure virtually unknown among cinephiles today, began his career as a director for Pathe Freres in 1910 and had the reputation of being something of an innovator. He was one of a crop of new directors that Essanay Studios had hired following an exodus of many of their top talent to the American Film Manufacturing Company. Wharton’s 1912 Essanay production of Sunshine, now lost, made a big impression on critics at the time for its creative use of superimpositions; one scene featured a character making a confession to a priest where the story of the confession appeared as an image within the same frame as the shot of the guy telling the story. A similarly visually flamboyant device serves as the emotional climax to Wharton’s From the Submerged, also from 1912, a movie that more than lives up to its evocative and poetic title. From the Submerged tells the story of a young, homeless man (E.H. Calvert) who is prevented from committing suicide in a public park by a complete stranger, a young woman (Ruth Stonehouse) who reminds him that God loves him. In a melodramatic plot twist, the young man soon inherits a fortune and, two years later, becomes engaged to a wealthy socialite. With several of their friends, the couple attends a “slumming party” where they visit a bread line that offers handouts to the homeless. The young man confesses his destitute past to his fiancée, who laughs and says, “How funny.” Realizing her shallowness, the young man decides to break off the relationship. Remembering the woman who saved his life, the young man then dons his former shabby attire and returns to the public park where he almost killed himself years earlier. There, he runs into the same woman from the beginning of the film and reminds her of their previous encounter. After a quickie wedding, he takes her to his home where she realizes, for the first time, that her husband is actually a wealthy man. While the plot of From the Submerged is similar to that of the contrived Victorian-style melodramas common to the era (a lot of narrative twists are crammed into a running time of less than ten minutes), the film is sensitively directed and well acted. There is also a lot more psychological and emotional complexity than what one typically finds in a movie from 1912. A scene of the young man tearing up a photograph of his fiancée, for instance, visually represents the end of their engagement. While this is, in itself, a familiar movie image, what really impresses about the moment is the way that E.H. Calvert slowly and sadly shakes his head while tearing up the picture, a subtle and exquisite bit of film acting. 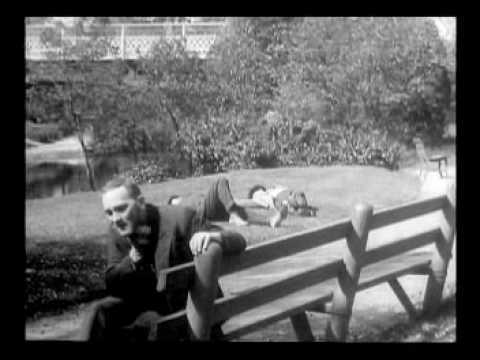 This is immediately followed by an even more impressive moment where the young man slowly starts to nod as he remembers his encounter with the young woman in the park, a flashback shot of which is superimposed above his head (a la Sunshine). The film’s social criticism, the ironic juxtaposition of wealthy and poor characters, the bread line scenes, the musical editing rhythms and the use of an internally rhyming structure (e.g., bookending the film with scenes in the same park) all show the obvious influence of D.W. Griffith’s groundbreaking A Corner in Wheat from 1909. In turn, the opening scene of From the Submerged may have influenced the Estonian-born French director Dmitri Kirsanoff, whose avant-garde masterpiece Menilmontant from 1926 (recently listed in my “Silent French Cinema Primer”) features a nearly identical sequence in which a character is prevented from committing suicide by a stranger in a park. From the Submerged can be viewed in its entirety on Dailymotion below. Chicagoans should take note that the climactic park scene was shot beneath “Suicide Bridge,” the now-extinct high bridge over the Lincoln Park lagoon. The exterior of the man’s home at the end was almost certainly shot on Argyle Street in Uptown directly across from Essanay Studios.